Cedar Creek Falls Retreat and Conference Centre is the ultimate Conference & Function venue 40 minutes from Brisbane City or Airport. Nestled amongst 260 hectares of native bush land, Cedar Creek Falls Retreat is a unique facility nestled in the rainforest, offering total privacy and exclusivity for your group. Cedar Creek Falls Retreat allows delegates to escape the urban jungle and retreat to a refreshing, stress free environment, devoid of distraction. Our conference rooms enjoy spectacular views and natural light with log fires and ceiling fans; catering for groups with a minimum of 10 to maximum 100. Wraparound balconies, courtyards and spectacular decks provide a number of breakout areas. Delegates can take time out from a busy conference schedule to revitalise with different activities such as golf, 18 holes nearby at Samford, Winery, local shopping at the Samford Village, Skirmish or horse riding. The golf courses located within 30 minutes drive include Pine Rivers and Keparra, Samford Valley and Wantima Country Club. We can also assist with professional facilitators, speakers, entertainers and corporate activity co-ordinators to make your conference an even greater success. Our comprehensive array of equipment makes presentations and discussion groups a breeze. Conference accommodation packages start with a minimum of 10 guests, up to 28. Day seminars and functions can cater for 20 to 100 guests. Guests can choose from 2 separate accommodation buildings with 10 separate rooms and 2 lofts, all enjoy balconies with fantastic views of the surrounding mountains. Cedar Creek Falls Retreat is Brisbane's newest conference retreat with a capacity of up to 100 people and the flexibility to host smaller conferences and meetings. The unique rainforest setting will ensure a great day /conference environment. All our meals are freshly prepared on the premises by our qualified chefs. 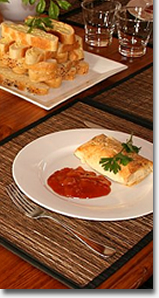 Homemade quiche, lasagna, savory filo pastries served with a selection of fresh crisp salads. A breakdown of prices will be sent with your quote on request. Total exclusivity and re-energising yourself is what Cedar Creek is all about and we look forward to welcoming you soon.